This gorgeous No 8 Outdoor Green has the finest details and highest quality you will find anywhere! No 8 Outdoor Green is truly remarkable. Product Details: Condition: Brand New Item SKU: SS-BRK-OP01715 Information: 4 1/4"" closed. 3 1/4"" modified Sandvik 12c27 stainless partially serrated blade with shackle key. 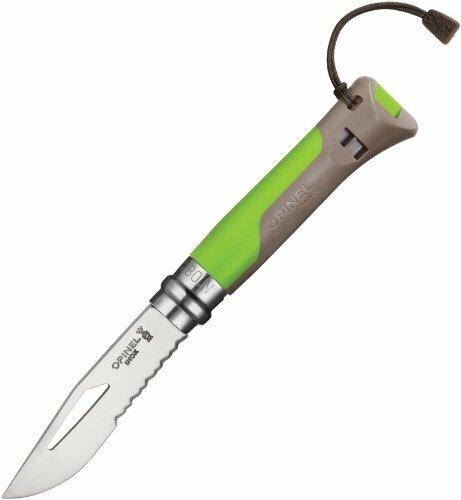 Coyote brown composition handle with a partial green rubberized grip. Highly resistant to humidity and extreme temperature. Handle features integrated 110 decibel peals survival whistle that functions in all weather conditions. Virobloc double safety ring. Lanyard hole with coyote brown nylon cord lanyard.